Here at Equifest, we pride ourselves on our association with the equestrian community. The assistance received from our many Judges, Sponsors and Supporters allows the show to grow and continually improve the experience for our competitors and visitors. In return, Equifest provides a platform to promote their company, with a target audience of active horse owners and riders. We hope that you too will consider getting involved with the Equifest experience and become part of our festival of fun. For more information or to discuss your sponsorship objectives, please contact Jenny Needham via email (jenny@eastofenglandarena.com) or telephone (01733 363500). Created to meet your budget and your objectives. Take advantage of our varying branding options and communication channels in reaching and talking to our loyal and devoted audience of horse owners and riders. Our on-going marketing platforms ensure your company gets maximum exposure throughout the year, not just during the event itself. Corporate Hospitality – Ringside wine and dine. Tailor your experience with the best in-house seats. 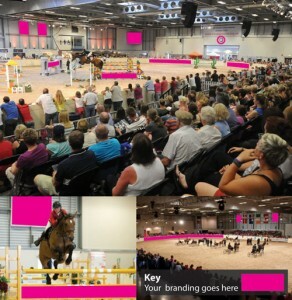 Talk to our Database – Personalise a company broadcast or sponsor Equifest’s communications. Big Screen Advertising & Branding – Showcase and advertise your brand and products. Media – Be a part of our extensive regional and national coverage across print, digital, radio and other broadcast press. Social Media – Interact with our growing network of over 25,000 members and followers. Complimentary Tickets – Treat your guests to a great day out. Trade Stand – Generate quality sales and leads. VIP Sponsors’ Lounge – Access to all the comforts of being a sponsor. Additional VIP – Experience evening shows from a VIP Pod. Join in the festival of fun and become part of Equifest’s Mini Town Community that delivers to all of its visitors’ needs. Why Have A Trade Stand? Generate sales and quality leads for your business from a captive audience. Interact with a ready made audience of horse owners and riders whom want to purchase products and services that will improve their riding and keep their horses healthy. Showcase and sample your products; educate and inform your target audience in a retail environment. Gather customer feedback and carry out market research. Increase your footfall from weekend shoppers. 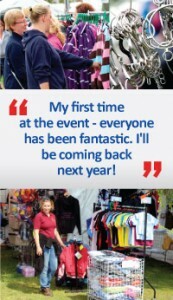 70% of all exhibitors return every year. Over 70 hours of retail shopping over the five days. Preferred rates in local hotels or on-site living. Dedicated exhibition manager looking after all of your logistics. Advertising in our glossy show catalogue, competitors schedules and website. Shopping vouchers driving traffic to your stand.